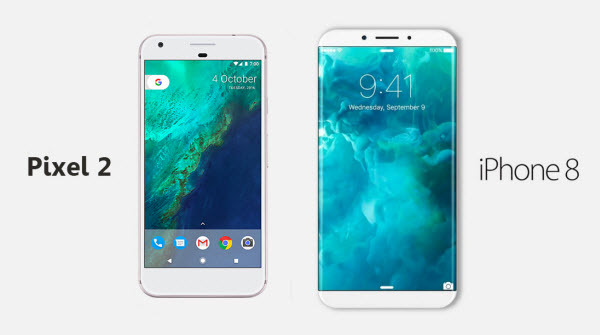 iPhone 8 vs Google Pixel 2, though the 2 major new models 2017 are going to keep us wait for another 4 months, rumor have mounted regarding their camera upgrades. In tradition, Google Pixel 2 is the reign of nightshots thanks to its superb light compensation technology, and the openness of Android makes it favorable to many. However, as iPhone 8 revamps its rear camera to be vertically positioned & ever more nimble, this is a play & kill of 2 founding men: the creator of iOS and the father of Android. So far, rumored prices for iPhone 8 vs Google Pixel 2 have distinguished them further for price-sensitive users than ever before, which one would you buy? Take a look at our review before you decide! iPhone 8 Release Date: Following Apple's year-long traditions, the upcoming new iPhone 8 will be released over a week after its September Event - usually the 19th day of the month in U.S.. However, due to "major hardware upgrades" this year, and also a possible lack of supply for its new material OLED display, iPhone 8 is likely to come out early October, half a month later than convention. Google Pixel 2 Release Date: Multiple sources of leaks point to a late-October release of Google Pixel 2, codenamed walleye, together with another Pixel XL model named taimen. ( Early sources suggest that a Google Pixel phone - muskie, a successor of Pixel XL would come out alongside, but its cancellation is now confirmed by Android Police, a reliable info provider). iPhone 8 Price: By calling it self top-of-the-line Apple iPhone, the iPhone hopefully is going to charge a whopping $849 with its 32GB model, with the 128GB and 256GB at $969 and $1099 respectively. Rumors suggest that another 2 s-models, aka iPhone 7s and iPhone 7s Plus are also coming out this autumn, starting from $549 and $769 respectively, offering more economic choices for users. Google Pixel 2 Price: Pixel 2 is a lot more pocket-friendly: staring from $649 only, the same as its first generation Pixel phone, which is quite a deal considering the employment of some state-of-the-art parts & chipsets: Google Pixel 2 uses Octa cores with 6 GB of RAM, margins ahead of iPhone 8's Quad, paired with 3000 mAh battery that lengthens its navigation time. iPhone 8 Front Camera: Telling from the specs table, iPhone 8's 7 megapixels front lens loses the game in front of Google Pixel 2 at 8 megapixel. Though iPhone 8 claims to features the same Retina Flash technology that helps light up the selfies, a test carried out by CNET in comparison of Google Pixel phone vs iPhone 7 Plus proves the former to win by a margin. Will iPhone 8 vs Google Pixel 2 front camera quality stay the same? You've got to wait and see. Google Pixel 2 Front Camera: Apart from the 1 megapixel win over iPhone 8, Google Pixel sports a 2.4 aperture front camera with wider-angle more suitable for selfies, which not only helps sharpen the picture, but also enable users better able to take selfies without over-stretching their arms. iPhone 8 Rear Camera: With its predecessor often considered as the reign of cameras, iPhone 8's rear camera is believed to go horizontally dual-lensed, better able to fit in for the AR-competent iOS 11. iPhone 8 relays the OIS (optical image stabilization) technology from its brothers, which Google Pixel 2 won't have, but we do expect improvements to its stiff flash lights, which makes shots with weak lights hard to recognize. Google Pixel 2 Rear Camera: Google's Pixel 2 sports fantastic rear camera, with improved light compensation in dark environment, fast-shooting without blurs, with close-up shots sharp and telephotograph refined with depth. Instead of the OIS technology (which iPhone use for wide-angle only), Google turned to gyroscope and software support to help stabilize the shots and videos, and just like iPhone 8, it can take 4K pictures and videos. iPhone 8 Siri: For each and every iOS, Siri gets smarter, more human-like and efficient. Taking a look at Siri on iOS 11, not only the pronunciation, which comes out with a male & a female option developed from deep learning, translation also becomes available. Now Siri can associate your Safari search queries with the news push service to provide better service. Google Pixel 2 Google Assistant: A born advantage helps Google Pixel 2 to win by a slight margin in this match: the AI bot called Google Assistant employs Google's robust search service to answer your questions in a smart way. Just like how you can wake up Siri on iPhone, press and hold Google's home button to call out Google Assistant, and it will help you with calculations, navigation, home control, scheduling activities, etc. Google Assistant has long been considered as a model to imitate for Siri. iPhone 8 Wireless Charging: Charging over the air has been a long debated rumor even before the release of iPhone 7, and this year wireless charging based on Qi and Airfuel protocol seems like a feature to arrive on iPhone 8 for sure. Google Pixel 2 Charging: Unlike the majority of Android phones staying with micro USB charge, Google stays with cord-charging with USB Type-C, coming with USB Power Delivery 2.0 power adapters and cables. Google Pixel 2 supports fast charging. iPhone 8 Water Resistance: Since iPhone 7, Apple started to add water resistance support for its newer models of smart phones. iPhone 8 is said to have IP68, enabling the mobile phone to go as deep as 1.5m water and stay intact for 30 minutes. However, you'd better take the 30 minutes duration as mere technical spec only. By calling itself water-resistant, iPhone 8 is safe if you spotted some water drops when washing hands, but don't risk it with the specs. Google Pixel 2 Water Resistance: Google Pixel 2, if staying with its predecessor Google Pixel phone, is not going be water-proof, so be careful when using it. iPhone 8 Display: We wouldn't say for sure about iPhone 8's display, which remains a topic over-debated every year. As of now, quite a number of websites have blogged about an edge-to-edge display made by OLED (or AMOLED, as is said by Samsung display manufacturer). Spec say iPhone 8 will go up to 5.8-inch display, which typically points to usable screen areas, achieved by Apple who aborted Touch ID & made 5.15-inch of useful screen into a model previously suitable for a 4.8-inch iPhone 7. Sandwiched by 2 glasses is a stainless steel frame. Note 8 Display: Unlike iPhone 8, AMOLED display was already adopted by Google Pixel phone, and so does Pixel 2, which features a slightly higher pixel density at 587 ppi than 441 ppi into a 5.0-inch screen size (the same as iPhone 7), screen resolution is higher here, at 1440*2560 when compared to the 1080*1920 for iPhone 7.
iPhone 8 iOS 11: Substantially enriched control center, now with iPhone 8 screen recording function. The brand-new File APP for iOS takes the convenience of file management on Android down to iPhone 8. iOS 11 also introduce Augmented Reality to iPhone 8, which allows users to build unparalleled AR experience to cope with iPhone 8's vertical rear camera. Google Pixel 2 Android OS: Google Pixel 2 sports Android Nougat, the 7.1 version of Android with special care for Virtual Reality to work with Google Daydream Gear, making the best of its 13 megapixels. By calling itself the sweetest Android version of all time, Nougat features more than ever emoji, a battery-saving mode called "Doze". Multiple-window operation is now made available on Google Pixel 2. 1 How to Add Songs to iPhone? 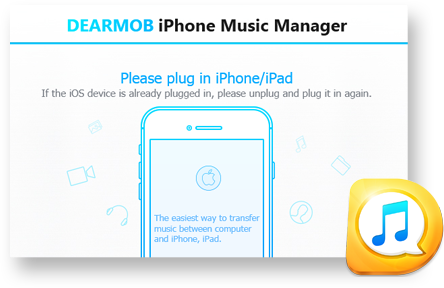 How to add songs to iPhone 8 for free and without iTunes? Read this article to know the answer, it teaches you how to add songs, music albums, playlist from computer to iPhone in the easiest way.